Amber Heittola is a shy 9 years old who has been with the Mounted Eagles program for three years. 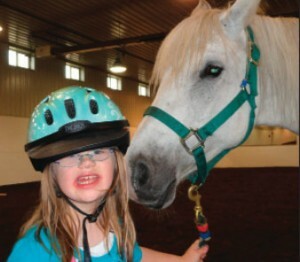 Amber, diagnosed with Downs Syndrome, continues to gain improved social skills from her weekly riding lessons. She likes both riding and interacting with her riding partner Rosie, a gentle little white Arabian horse. Amber also enjoys working with her volunteer riding coach, Christina. Once mounted, Amber works on her reining skills and listens to Christina’s direc- tion as she moves Rosie around the arena. When dismounted, Amber likes to hold Rosie’s lead rope with Christina by her side. Amber giggles as Rosie moves in closer to do some inspecting of the young rider. Amber, a 3rd grader at Riverside Elementary, loves going to school. She also gets to spend time with her best friend who attends school with her. Amber lives in Brainerd with her parents Lisa and Russell Heittola and big brother Evan. Amber likes to help Evan with his baseball and basketball practice by throwing balls to him. But her favorite thing to do is to play with her Barbies, or the “girls” as she calls them. Amber plays computer games on her iPad, usually with a Barbie theme, and likes to sing along and act out movies. Her favorite movies are of course Barbie movies and “Dora the Explorer.” Family time is spent going four-wheeling. Amber even has her own four-wheeler to ride, but often prefers to ride with her Mom or Dad. Amber’s favorite food is Chicken Nuggets and she requests them on a regulate basis. The Heittolas have watched Amber become more vocal as her confidence has grown from her riding les- sons with the ME program. Amber, we are glad to have you in our ME family and look for- ward to your continued success. Congratulations on being selected as the Mounted Eagles Rider of the Quarter!